Our hero previously rigged a court case with a false witness to help a career criminal get a second chance. Simon shamelessly participates in insider trading. Simon’s wife is running around with another man. She’d also been previously divorced. Pretty much the only way to avoid blackmail is to blackmail the other person. 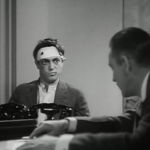 Counsellor at Law is one of those great movies from 1933 that showed that Hollywood had fully gotten past its early talkie days. It’s a complex, brilliant piece of art, filled with color and character that would soon be dulled by the oncoming Production Code. It’s vital and fun, and well worth a look for any film aficionado. Now that I’ve pitched that, let’s talk about the picture: high up in the Empire State building is the law office of Simon & Tedesco. It’s populated with an eclectic number of characters, from the singsong phone operator, the Irish private detective, the stuffy accountant, the obsessive researcher, and the loyal secretary. 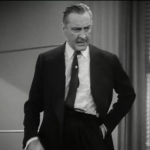 It’s a high class law firm that still caters to the common man, with its centerpiece, brilliant orator George Simon (John Barrymore), balancing his time between helping out clients from his old neighborhood and hoodwinking the richer clients with daring (and successful) defenses. Is this the earliest “the jail cell shadow” on film? Probably not, but it’s well used. The movie plays as surprisingly modern, a tight thriller that covers three different days, each at a different time of the day. We begin in the morning on the first day, going through the routines and beats in the office as it opens up. Constant phone calls, clients piling up, and the rapport of the coworkers tweaking one another. It leads up to the arrival of Simon, a Jewish lawyer who’s married a high class wife, Cora (Doris Kenyon). He’s happy to do almost anything for money, from freeing a murderess to working with a girl named Lillian La Rue on a breach of promise suit. There are three major threads that carry the story: Simon’s relationship with his wife wherein he’s an unaware cuckold, the possibility that he may be disbarred for falsifying a witness a number of years ago, and the delicate social position he finds himself in as a wealthy, powerful lawyer who remains besieged by rich WASPs. A picture of Thelma Todd is worth a thousand views. It’s that last point that unites the two former ones. His wife, who originally found his lower-class charms arousing, can now barely sit in the same room as him and treats his mother as a practical stranger. She now runs around with Roy (Melvyn Douglas), a rich wastrel whose only desires are to keep all his old money and seduce bored wives. As for the disbarment, the charge is led by a hypocritical old money man who wants to ‘clean up’ the lawyer profession, which unsurprisingly comes down to class lines. 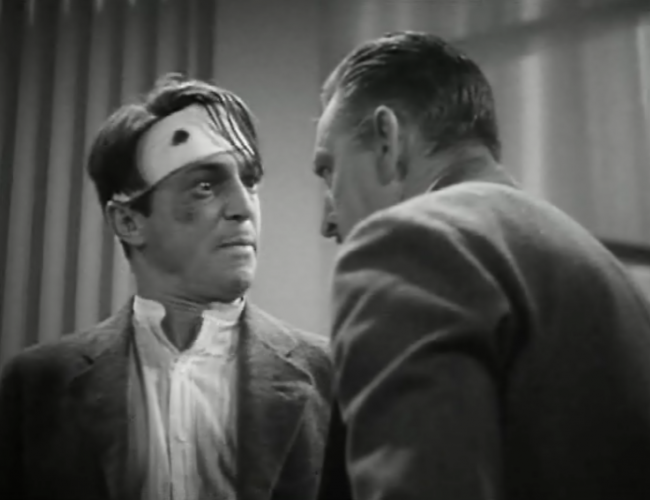 The conflict becomes more pronounced with the introduction of a young Communist named Harry Becker (Vincent Sherman), whose family came from the same block as Simon’s. Becker was thrown in jail after making a pro-Communist speech in the park and being beaten. Simon secures his release and orders him to his office for talk in hopes of keeping the kid out of trouble, but rather it’s Becker who shakes Simon out of his comfort zone in a terse argument. Wyler uses a lot of closeups and shots where the actors eclipse each other, giving this moment an unusual intensity for the era. Simon’s problem is that, like so many others, he’s bought into what we nowadays call ‘The American Dream’. Success, smarts, and hard work should lead you to acceptance in a society that seems to honor those merits. In reality, social circles are carefully guarded, populated by snobs who care more about ancestry than work– except what they can bleed from you. Becker sees this, and points out that the lawyer’s quest to earn money and prestige playing into the bourgeois’ game. He views Simon as a class traitor, and unnerves the man completely. It’s through this prism that we can see the rest of the movie as Simon coming to terms with his own disillusionment with the world and how it almost shatters him. A brief side note — it’s fun to see a Hollywood movie that portrays a Communist with a shred of sympathy. Becker certainly gets more kindness and understanding than any of the wealthy characters in the film. Only during the Great Depression could you get away with that. Simon’s partner in the film, Tedesco, is a real rarity for the pre-Code era: a friend who sticks by his side when things look tough. Another touch that makes the movie, even as be-Deco’d as it is, still seem fairly fresh. Simon’s frustration spirals. Even after he nimbly dodges the threat of disbarment, he learns of his wife’s affair. Realizing that he’s been had, he stares at the open window, viewing it as the only option to stop the pain and save himself from indignity. 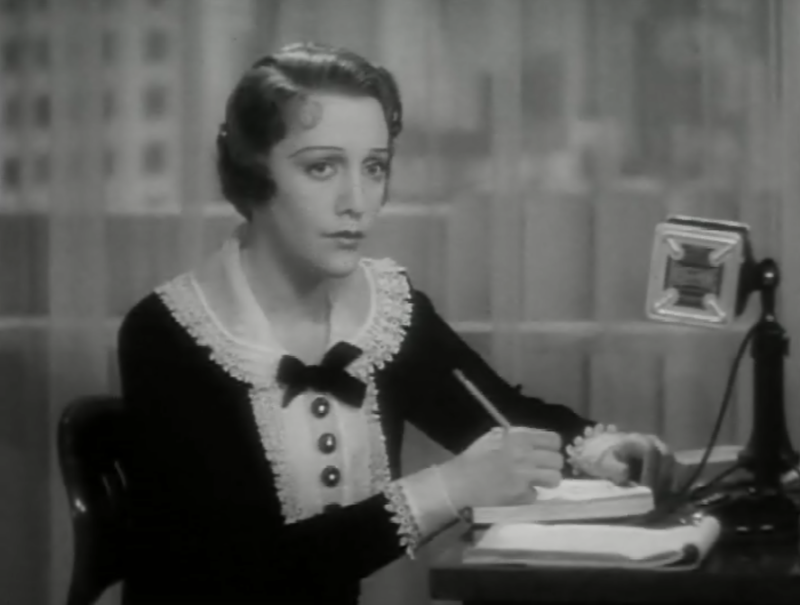 The spell is broken because of an unlikely source, the devotion and affection of his secretary Rexy (Bebe Daniels, in a very thankless role). She is one of the few who can see all the work and kindness that Simon possesses without viewing his background as a handicap. It’s through her that he finds redemption of sorts and realizes that his hard work wasn’t just for acceptance– it’s because he loves doing it, and he’s damn good at it. In a way, the high profile, controversial court cases he pushes are the perfect way to thumb his nose at the establishment. 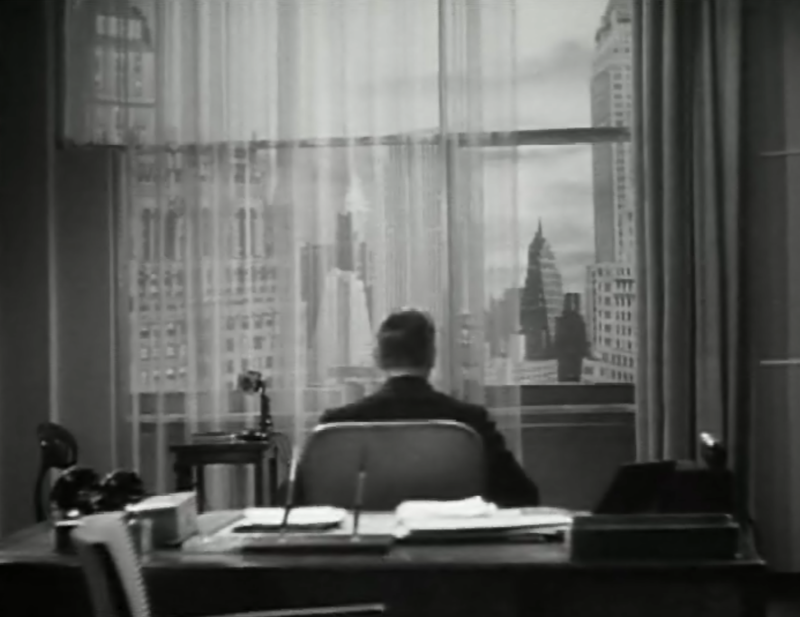 One of many times Wyler effectively uses silhouettes in the film. One of the pleasures of the movie is that the dialogue is snappy and intense. Barrymore seems to be prepping for his roll in Twentieth Century as the banter rolls fiercely and fast. 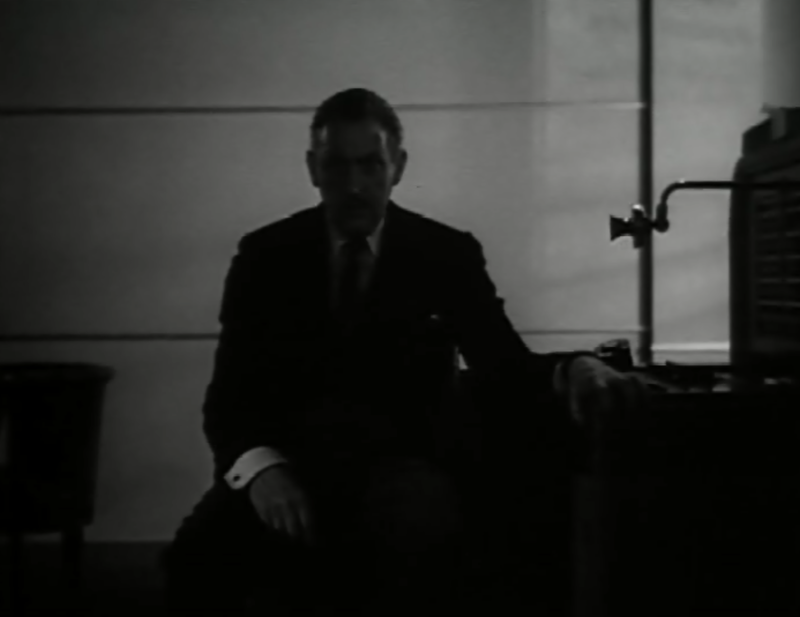 Director William Wyler deftly counterbalances that, though, using the camera to look back at a frustrated Barrymore whenever he spares an introspective moment. 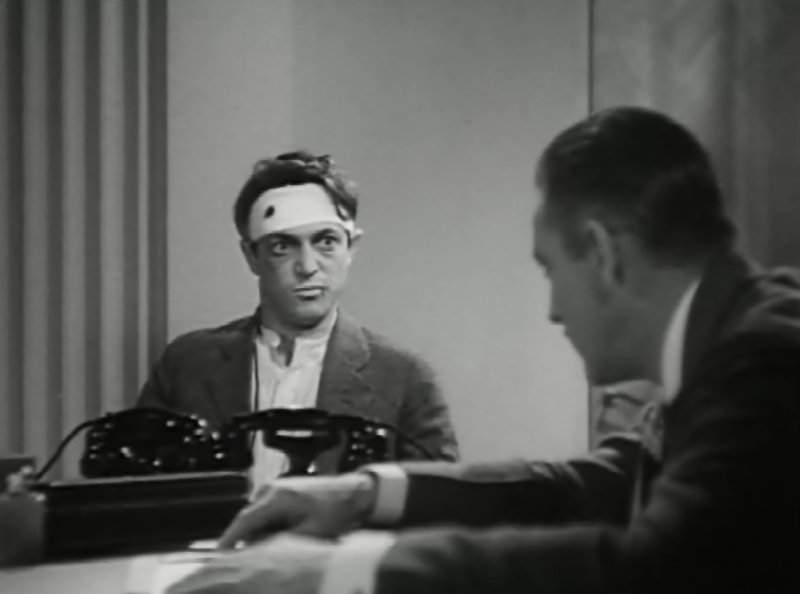 It’s fun to compare Counsellor at Law with the other “mouthpiece” lawyer pictures of the early 30s, including the other great John Barrymore flick, State’s Attorney. 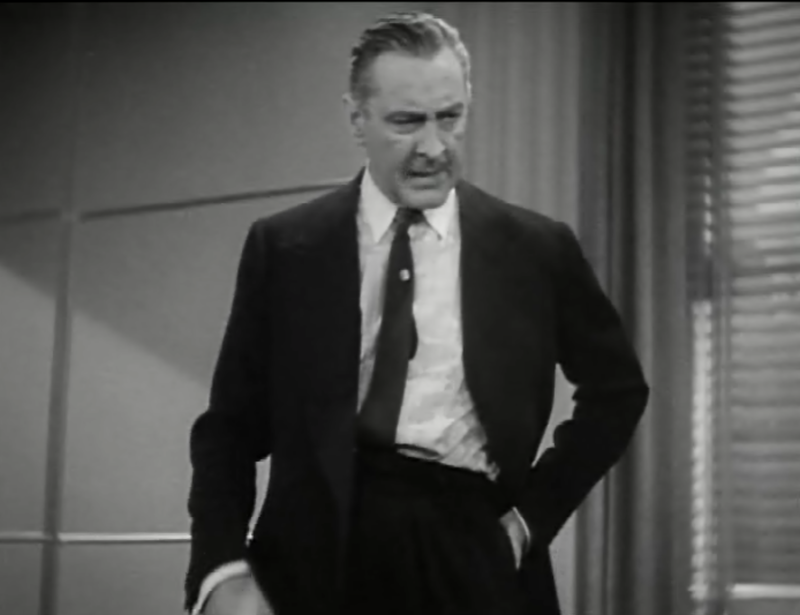 There, Barrymore’s skills in the courtroom are highlighted, but that movie is equally concerned with the gray area between the law and personal morality. In both, self destruction seems inescapable, but the kindness that the characters possess finally come back to them in the last act. Like in other movies of the era, you can be a scoundrel, but as long as you’re doing it for the right reasons, fate (and the screenwriters) will find you a happy ending. 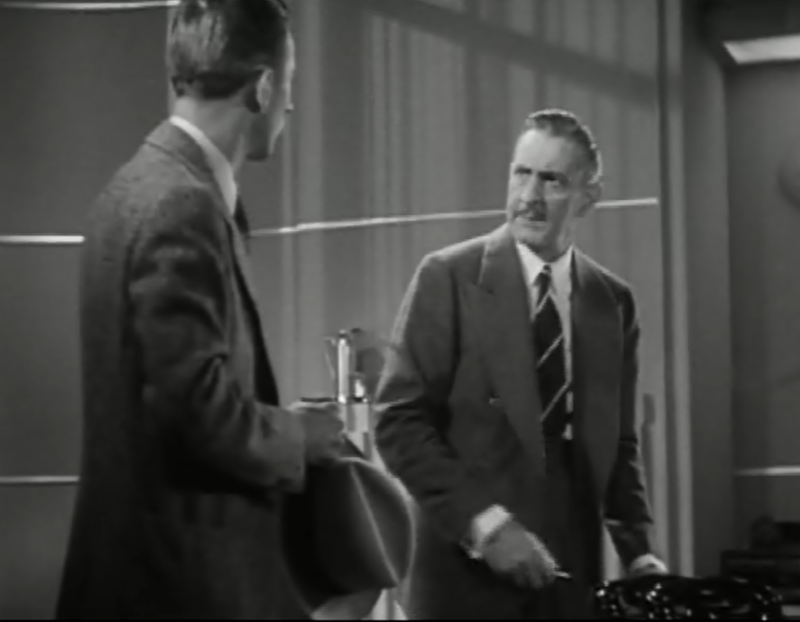 Counsellor at Law is a nice little gem, one that captured one of Barrymore’s last great roles and showcased the rising talent of director William Wyler. It’s filled with naughty bits and a lot of New York culture, showing a fascinating cross section of a world long gone as competing classes of white immigrants and culture battle for their dignity, all told in a zippy, clever package. It’s one of the undeniably great movies of 1933. This review was originally supposed to be a part of the Barrymore Trilogy Blogathon hosted by In the Good Old Days of Classic Hollywood. Uh, but after finishing my review, I checked their site and it appears they never approved my comment requesting to cover this movie. SO THIS ONE’S FREE. Based on a very successful Broadway play that starred Paul Muni in the Barrymore role. Muni was under contract to Warner Brothers at the time and declined taking the role in the film version, fearing he’d by typecast. Many in the supporting cast recreated their roles from the Broadway version. There are many memorable scenes in the film, but one of the most striking is an encounter in George’s office between his wife and his mother. The scene lasts less than a minute, but it furnishes an excellent illustration of the personalities of the two women, as well as the vast chasm that exists between their worlds. When Cora enters the office, she actually shakes the hand of George’s mother, asking her “How do you do?” as if she were nothing more than a casual acquaintance. Mrs. Simon makes an effort to be sociable, inquiring after Cora’s children and commenting on her hard-working son, but Cora is politely distant, scarcely bothering to contribute to the seemingly interminable exchange. At best, it’s awkward – at worst, it’s almost painful to watch. In one of his characteristic flourishes, Wyler teases the audience like another client waiting in line by keeping Simon out of sight; our lead-up to the “reveal” is Barrymore’s hands working the phones on his desk. 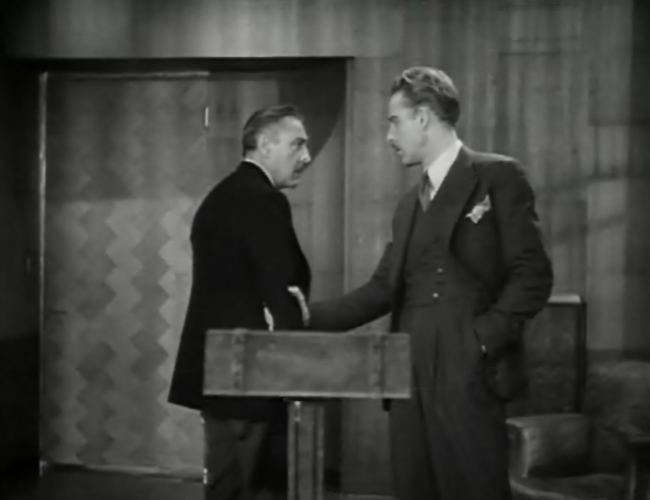 When Barrymore finally appears, it seems designed to encourage applause, a frequent occurrence in the theatre when the big-name star makes his or her first entrance and a nod to the stage origins of the film. Over-the-shoulder shots with delayed reaction shots, a Wyler staple, also dot Counsellor at Law. The most effective one shows Harry standing, his fist clenched, when he hears Cora’s children disparage the working class. When we finally do see his beaten face wild with anger, Wyler switches to the children and moves slowly in on their frightened faces. Here’s a contemporary review from the New York Times, which mentions that this film took over from Little Women at Radio City Music Hall. Stills and posters at Doctor Macro. Everson’s film NYU film notes, found here and here, talk about how he finds Wyler’s early films to be better than his later works. Briefly reissued in the very early 1950’s, never released to tv, “Counsellor at Law” has been unavailable for some 20 years due to legal complications, and it’s good to see that after that long hiatus it hasn’t lost any of its values: it’s still top Wyler and top Barrymore. This latter is perhaps a little surprising, for it was made at a low spot in Barrymore’s career and private life. Despite his ultra-prolific screen work in the early 30s (or perhaps because of it) his name was losing box-office potency. his third marriage was a wreck and he was drinking heavily. His last long-term starring contract (at MGM) had ended with “Night Flight”. “Counsellor at Law” was his first film on a single-picture contract, and it would be followed by the first “B” of his career – “Long Lost Father” for Rko. […] Fortuitously, the very nature of the role paralleled Barrymore’s own state of mind. Whether the role “covered” him, or whether he was still a great enough actor to overcome his personal problems while before the camera is open to question. Perhaps it hardly matters, for no matter how it was achieved, it remains one of his finest, most dynamic and certainly most poignant performances. It’s been a number of years since I last watched this film. You have encouraged me to raid my sister’s movie stash and I’ll hold it hostage until she returns some DVDs she’s pilfered from me! Ha! I hope you dig it out, it’s a good one. As always, Danny, you knock it out of the park. I agree that Bebe is wasted. It would have been more fun if there were 2 La Rue sisters. Ha! 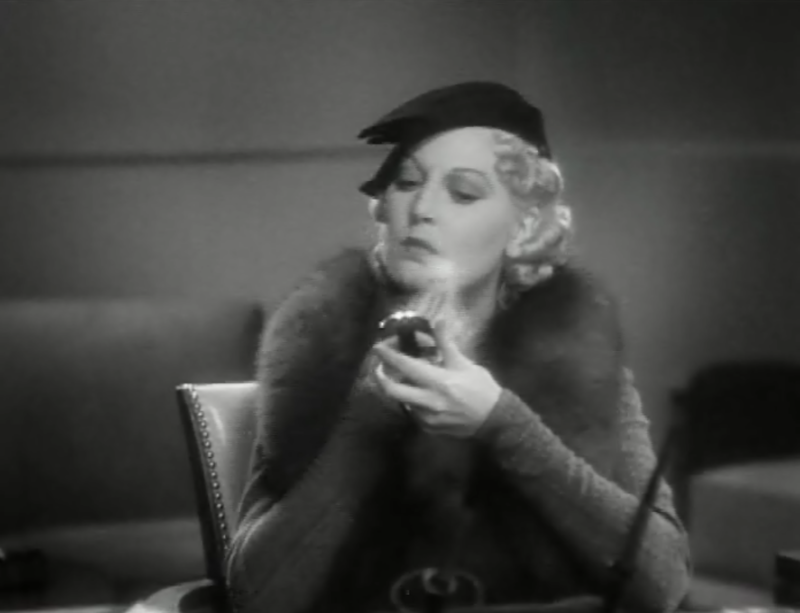 Now I’m imagining Thelma Todd playing twins. It’s too nice of a thought for this world. I like this one too, but I think you like it a bit more. Dialogue is great, I agree, but it feels stage bound at the same time (only natural, I suppose). 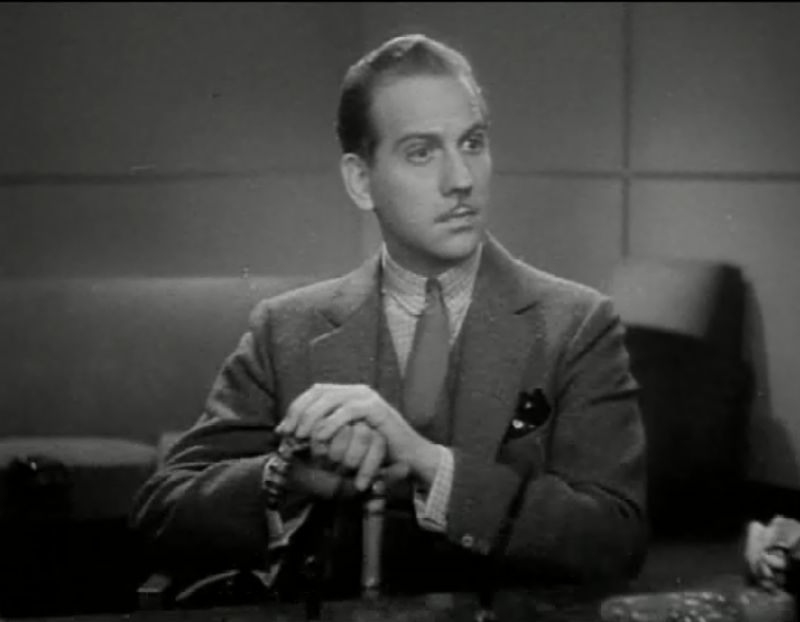 I thought Melvyn Douglas was a bit wasted. I enjoy State’s Attorney a little more, even if this was clearly the more ambitious title thanks to its roots. That said, I do always seem to watch them together, just as you’ve linked them here. Excellent review, as always! I thought they used the stagebound feeling to their advantage, especially in the moments leading up to Simon’s entrance. I think State’s Attorney is more *fun*, but I think Counsellor is a deeper, more intimate work. This sounds terrific! I’m not that familiar with William Wyler’s work from this period, but this film seems to be a good place to start. Danny, someday I’ll use your site as my only watchlist. Seriously, your tips are so good! 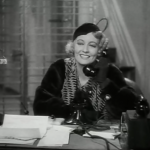 I have to check Counsellor at Law (because I can’t say no to Thelma Todd) and, OMG, there is blackface? This is what I call risky! Terrific analysis of this film’s social and political undercurrents; Sherman’s character is especially striking because he’s really the pivot point of the plot. It’s beautifully directed by Wyler; you can already see his control over long takes and use of space to create tension in character relationships. I think both Barrymore and Daniels are brilliant in their roles, but Daniels especially; she has to convey so much without direct dialogue and through subtext. Her career already seemed on a bit of a decline by the time of this film (she was a big star in the 1920s); I wish other directors could have taken advantage of her powerful dramatic talents. 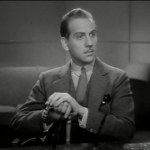 Great appreciation of this great film – I agree it’s one of Barrymore’s finest and I also love State’s Attorney. Great point about the sympathy for Sherman’s character probably not being possible under the Code. 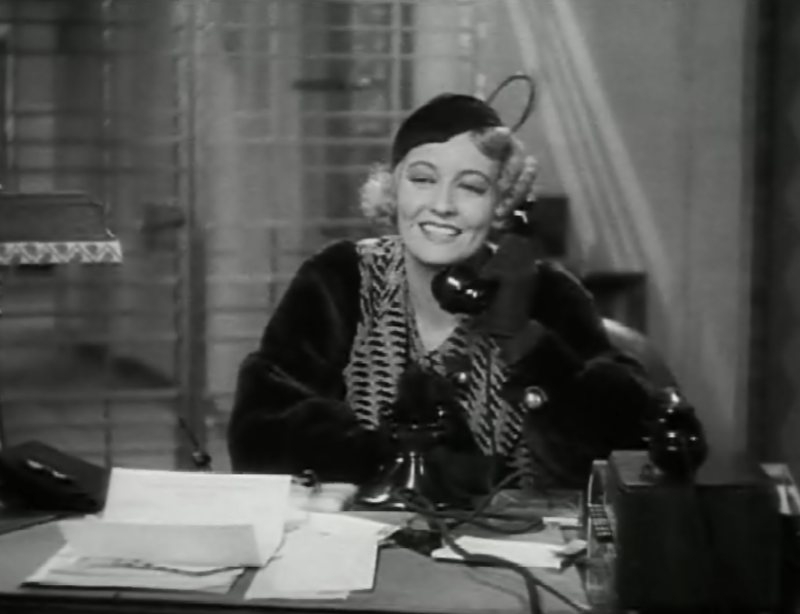 I love the way the characters keep moving to and fro through the building and enjoyed all the support characters- Isabel Jewell is hilarious as the switchboard operator. 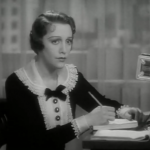 Yes, Jewell’s singsong delivery that quickly segues into a more devilish one whenever it’s time to gossip is a hoot. Thanks for coming by, Judy! the film is showing this evening (7/27/18) at UCLA at 7:30. it’s a nitrate print!